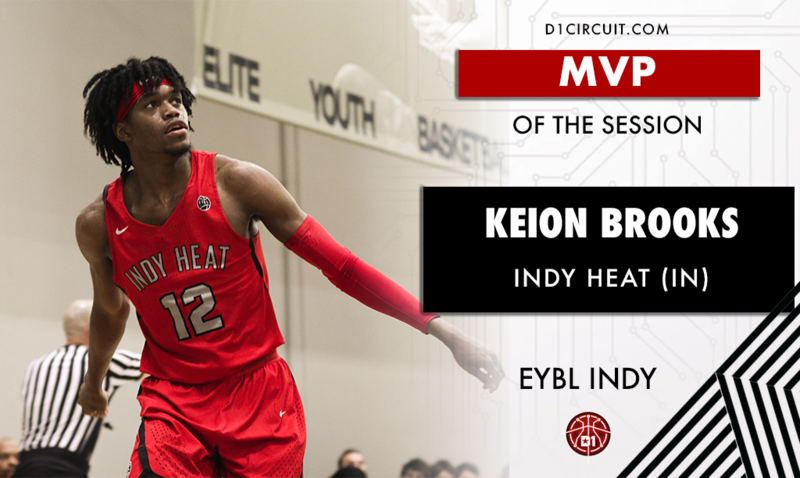 For the second straight season, Keion Brooks had the opportunity to play an EYBL session in front of his home crowd. Last season went well. Indy Brooks averaged 17.8 points per game, and the Indy Heat went 3-1 for the session. Once again, Brooks shined bright in front the home crowd, averaging 23 points and seven rebounds while leading the Heat to a 4-0 record. Brooks' versatility was on full display, and he wowed the crowd on numerous occasions with with highlight-reel dunks. The 6-foot-8 swingman is a lot of fun to watch offensively, but it's the evolution of the other aspects of his game that his coach has noticed. "Everyone knows how gifted (Brooks) is offensively," head coach Jason Delaney said. "But he's embraced the challenge of becoming a big-time defender." Brooks' defense has indeed evolved. Due to his length, athleticism and quickness, he can efficiently defend multiple positions. He's become a vocal leader on the defensive end, and it's truly made the rest of his teammates better. Also worth nothing, according to Delaney, is that he simply tries harder than everyone else. "(Keion's) effort on both ends of the floor in Indy was a major factor in our success," Delaney said. "He was the leader this team needed." Moving forward, the Indy Heat have to feel great about their chances. Brooks is playing the best basketball of his young life, and he's only going to get better. What's next for Brooks? The official prognosis from Delaney was direct and to-the-point. "He'll continue to show is he one of the top ten players in the 2019 class."